The top-seeded girls’ 18s player at the 12th Annual USTA International Spring Championships survived a slow start to win in three sets, while the top-seeded boys’ 18s player wasn’t as fortunate, falling in three sets. On Day 3 of the ITF Level 1 tournament being played at StubHub Center in Carson, unseeded Jessica Livianu of Brooklyn, N.Y., got off to a quick 5-1 start and took the first set off No. 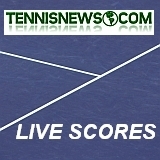 1 Amanda Anisimova of Hallandale Beach, Fla., 6-4. 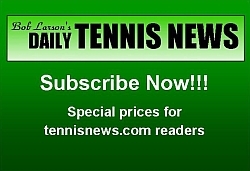 But the 14-year-old Anisimova rallied to take the match, 6-3, 6-2, during the second round of action. Top-seeded boys’ 18s player Ulises Blanch of Deerfield Beach, Fla., also fell in his first set against unseeded Patrick Kypson of Greenville, N.C., 6-4, pulled out the second 7-5, but was unable to complete the comeback as Kypson got hot late to win the last four games and the match, 6-4 in the third. Anisimova survived the fast-playing hard-court surface, saying said she is used to playing on slower clay courts and hard courts. “I didn’t start out very well and was making a lot of mistakes and had to get adjusted to the fast courts,” said Anisimova, ranked No. 11 in the ITF world rankings. 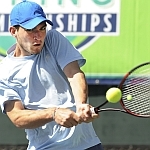 Carson ISC defending champion William Blumberg of Greenwich, Conn., also had a tight first set, falling to Sebastian Korda of Bradenton, Fla., before coming back to win, 5-7, 6-2, 6-1. The 6-foot-2 Korda, 15, is the son of former Top 10 world-ranked player Petr Korda of the Czech Republic, the last Czech player to win a Grand Slam singles title, the Australian Open in 1998. 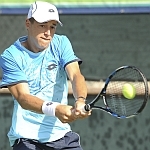 Korda is coached by his father, and also trains with the USTA in Boca Raton, Fla., with coach Leo Azevedo, who is in Carson with him this week while his father will coach him at the ASICS Easter Bowl next week. Later in the day, Korda moved into the 18s doubles quarterfinals with partner Vasil Kirkov of Tampa, Fla. In the Girls’ 16s, Eryn Cayetano of Corona, Calif., is the only remaining unseeded player and into Thursday’s quarterfinals. 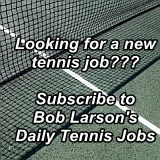 She trains with the RAMP Tennis Academy out of StubHub. 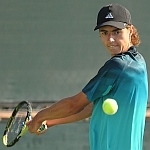 In the Boys’ 16s, Matthew Segura of Los Angeles holds that same distinction as the last remaining unseeded player upset No. 3-seeded William Grant of Boca Raton, Fla., 4-6, 7-6 (5), 6-2.